It’s fight week in Saskatoon! 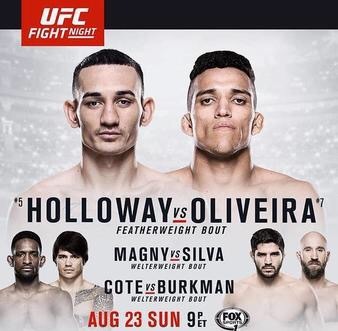 UFC Fight Night 74 Holloway v Oliveira!! You know, the closer we get to this thing, the more pumped I am about the UFC coming to Saskatoon. You are starting to see more promotion of it now, particularly at the various SIGA casinos which have been hyping UFC for the longest time. In fact, I may get to cover one of their pre-fight events. Randy Couture is scheduled to be at Dakota Dunes Casino on Whitecap Dakota First Nation on Saturday, and we got a media invitation from SIGA so as it stands now it looks like I’ll go — out of boredom, really. The thing that bugs me the most has been the general lack of local media coverage for this UFC fight. I’m finally seeing quite a bit of coverage now in the Star-Phoenix, but apart from them it’s been terrible, and quite honestly I don’t get it. Maybe I’m simply tuning into the wrong local TV and radio stations. In fact, that’s likely the entire problem — I need to listen to more FM hard-rock stations instead of these AM ones that tailor their programming to the boring people. With all due respect to the ‘Riders, they aren’t going to be shown on Fox Sports 1 to millions of people in the United States, or around the world for that matter. This UFC Fight Night 74 event may not be the most compelling card in MMA history in terms of big names, but it’s the first UFC event in Saskatchewan and the biggest sporting event in the province this week, or even this year for that matter. Based on what I’m reading about what is in store at SaskTel Centre, it sounds like Saskatoon is in for quite a production. The card itself seems solid, and I understand ticket sales are strong. People ought to be bloody excited! And who knows, maybe they are, but you wouldn’t know it from our media. In any event, if you want any real coverage of this, forget CKOM/CJME, CKRM, and everyone else here, and tune in to MMAJunkie Radio on SiriusXM. Hopefully, they’ll say something about the fight. It’s sad that in order to find coverage of a Saskatchewan fight night that you must listen to a show from Las Vegas, but at least these guys are knowledgable. As well, look for tons of articles on MMAJunkie at USA Today, and also SB Nation’s MMA Mania. There is also Fox Sports. And there are a few other sites such as MMA Fighting, MMA Weekly, Sherdog, Bloody Elbow and others. It is so cool seeing Saskatoon mentioned on various MMA fight websites that usually talk about big events in Vegas and places like that. First, here is the card as it stands now. Also, as you know there has been a slight change to the card as Neil Magny has replaced the injured Rick Story in the fight against Erick Silva. Sportsnet has up this story about the Canadians on the card. Here is a schedule of events going on throughout the Fight Week, which includes the UFC Experience, open workouts and autograph sessions with some of the fighters. I notice there will also be ones with the ring girls Chrissy Blair and Vanessa Hanson. I notice MMA Mania has up predictions for the prelims here and here. Finally, here’s a story about Brock Lesnar dissing Dana White’s sales abilities compared to Vince McMahon, a piece in which we are reminded that UFC Fight Night 74 in Saskatoon is up against WWE SummerSlam and therefore is going to be killed in the TV ratings. Yikes! Well, hopefully somebody will tune in the fights on Sunday. Previous Post I agree with Pam Anderson! This Baywatch movie is a bad idea! !